Holy Wicked Good Seafood, Batman! Apparently, my mom had made quasi plans with her best friend for dinner that same evening, so when I arrived at their house the other night, I was pleasantly surprised that we’d have an extra guest for dinner. I had originally planned to get all creative, since Gorton’s provided me with a variety of recipe ideas and such, but I thought it would be an excellent test of the product to see how quickly (and more importantly, EASILY) I could prepare a meal on a weeknight. 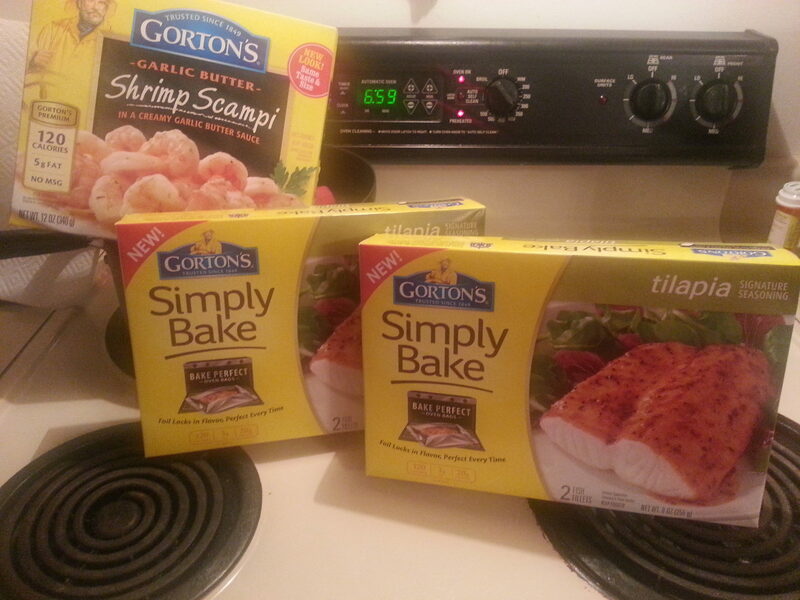 I purchased 2 different Gorton’s seafood products for this particular meal, Garlic Butter Shrimp Scampi (since Dad loooooves garlic) and Simply Bake Tilapia. 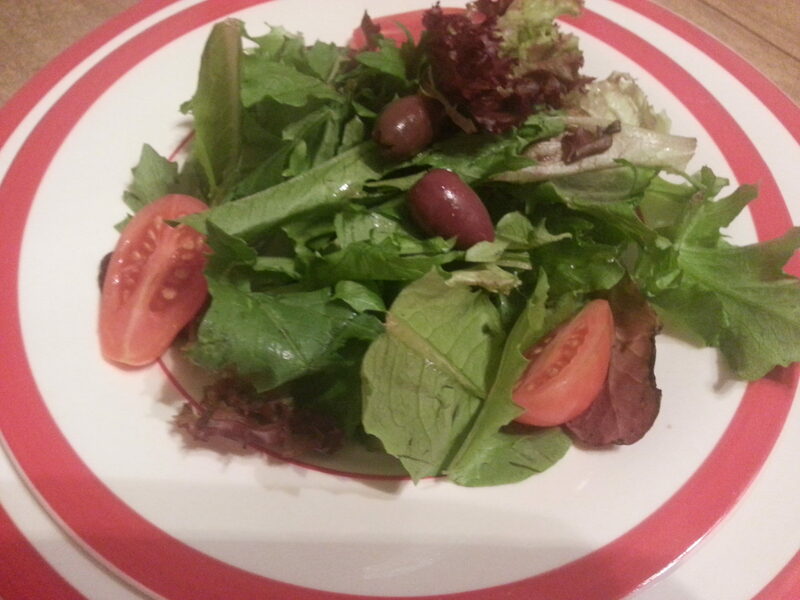 I also brought a mixed greens salad, and poached the rest of the meal from my mom’s garden/freezer. 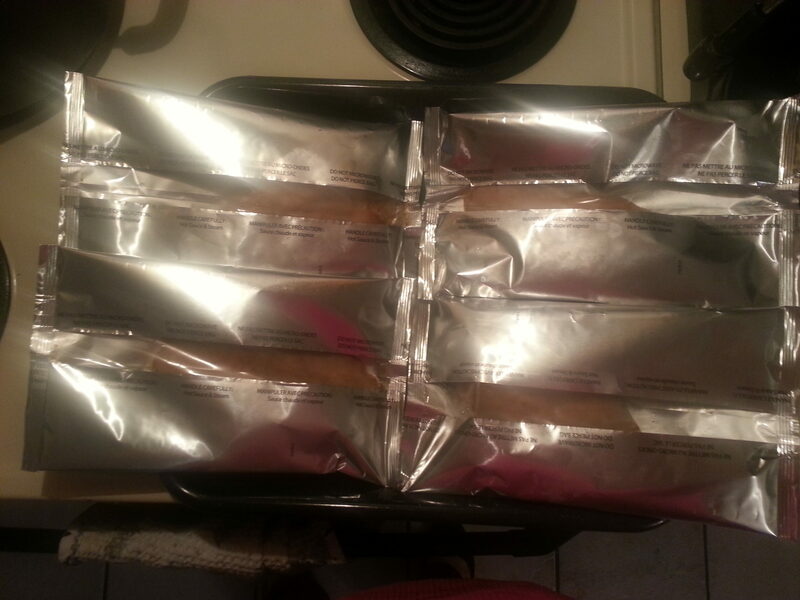 When I was en route, I had asked my mom to prep the oven to 350 degrees, so everything would be ready to go. I arrived, did a quick prep of cutting potatoes, tomatoes and red pepper strips, mixed the potatoes with a smidge of olive oil and some salt and was ready to go. Then I poured myself a glass of wine and joined the parentals out on the veranda (the backyard patio) for an appetizer of Mom’s homemade salsa with chips. 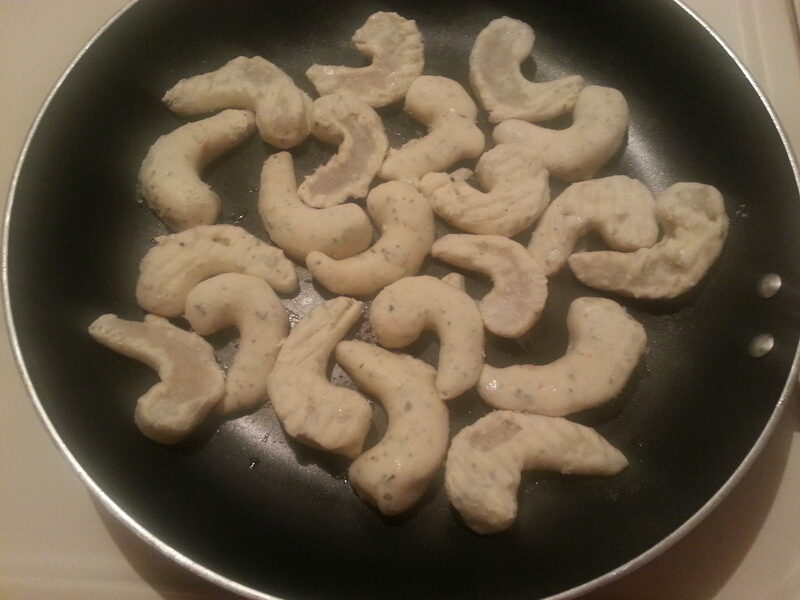 I took a quick break from chatting to start the scampi, which I set out in single layer across the frying pan. At the same time I poured frozen green beans into another pan with sliced peppers, a little olive oil and some season salt. I returned to the wine shortly thereafter. A few minutes later, I went and checked on the scampi, and oh-man! They were lookin’ and smellin’ WICKED GOOD. So I flipped them and let ’em simmer some more. I did add some water so the sauce didn’t boil out. 10 minutes later, I was ready to plate up the meal. A grand total of 40 minutes went by from prep to completion. I call that a definite dinner win for something amazing. How do I know it was amazing? Check out the pictures. If you’re not hungry after this…well…you get the picture. A simple salad with grape tomatoes, kalamata olives, parmesan cheese and Mom’s homemade Italian dressing (OK, I took the picture before adding cheese and dressing. I was hungry!! Yes,the sauce came out of the bag with the fish. Yes, the two seafood dishes combined well together. Yes, they all partnered up nicely with the potatoes and veggies. A few extra things to note: You know how I have a tendency to hurt myself in the kitchen? It’s almost impossible with this stuff. The bag opens easily enough that I didn’t need to use a knife and I let the fish sit for 5 minutes before I served it (And it stayed warm in the bag, but was safe to touch on the outside!) The flavor? Phenom. 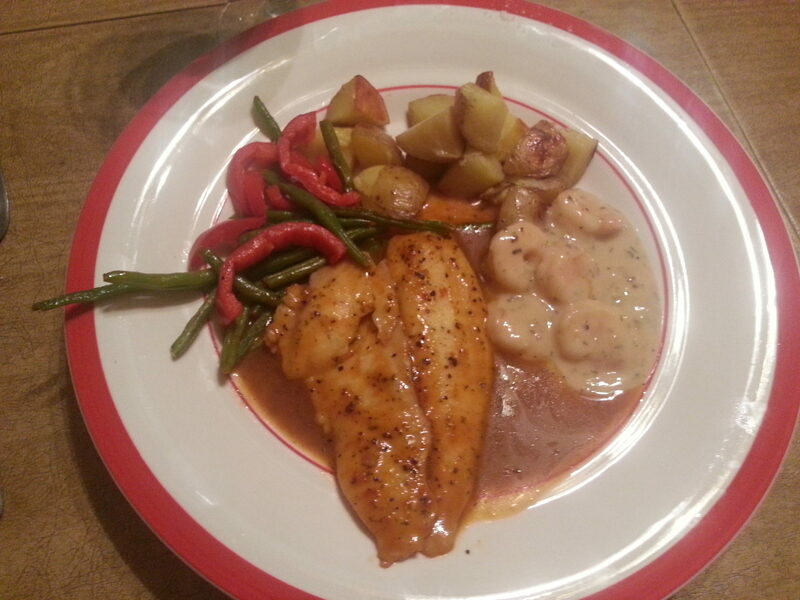 I preferred the tilapia to the shrimp, but both were AWESOME. As I’m back on the Weight Watchers wagon (after a whole lot of on and off), I wanted to make sure that I got something that was healthy and delicious. The tilapia? 3 points plus. 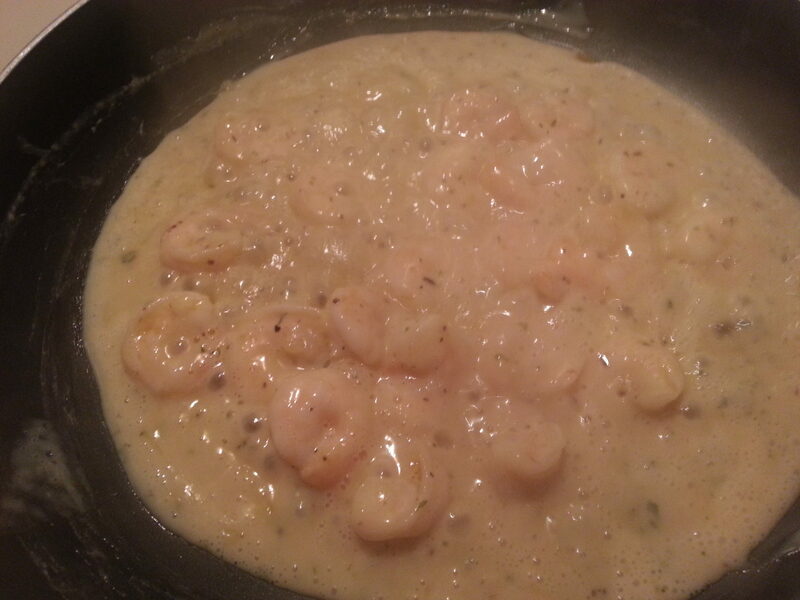 The shrimp scampi? 2 points plus for the serving size we made. A standard serving is 3 points plus, but we divided the box between 4 of us instead of 3. Everyone was thoroughly impressed with the meal, and both of my parents made separate calls to me the next day to thank me for the wonderful dinner. None of them would have purchase Gorton’s before our dinner, but all 3 said they would eat it again in a heartbeat. Tell me Blog Friends, have you tried Gorton’s? What are your favorite seafood dishes?